A panoramic tale of 1930s New York and Hollywood with a kaleidoscopic cast of characters that range from movie stars to millionaires, playboys to professors, and working girls to wise guys. Poignant, and often hilarious, Café Society, a film with a novel’s sweep, takes us on a journey from pastel-clad dealmakers in plush Hollywood mansions, to the quarrels and tribulations of a humble Bronx family, to the rough-and-tumble violence of New York gangsters, to the sparkling surfaces and secret scandals of Manhattan high life. 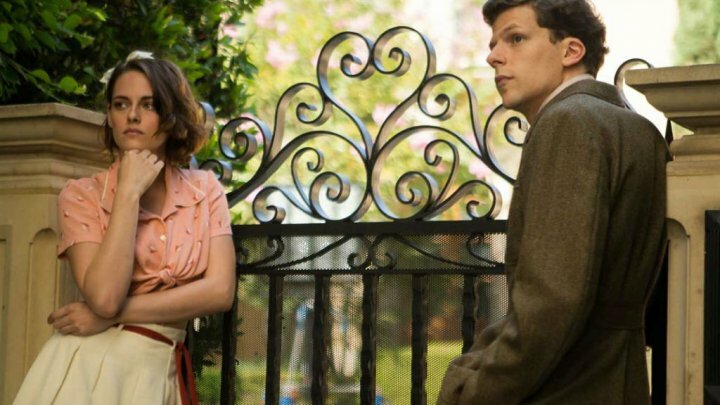 With Café Society, Woody Allen conjures up a 1930s world that has passed to tell a deeply romantic tale of dreams that never die. 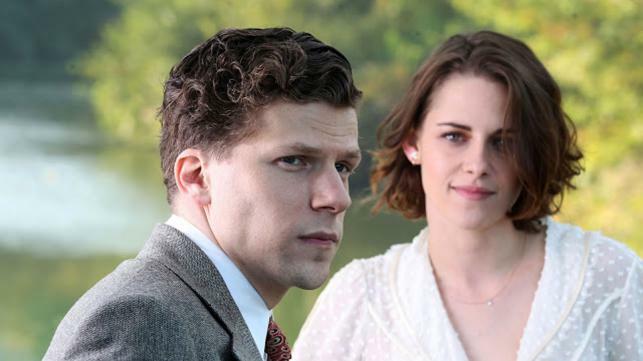 Woody Allen’s bittersweet romance Café Society follows Bronx-born Bobby Dorfman (Jesse Eisenberg) to Hollywood, where he falls in love with Kirsten Stewart, and back to New York, where he is swept up in the vibrant world of high society nightclub life. “Café Society” refers to the socialites, aristocrats, artists, and celebrities who gathered in fashionable cafes and restaurants in New York, Paris, and London in the late 19th and early 20th Century. The term became popular in New York City in the ’30s, after the end of Prohibition and the rise of the tabloid journalism that avidly covered the denizens of Café Society. There were dozens of dazzling clubs in New York City at the time, including some with 50-piece orchestras. Every night the glitterati donned tuxedoes and gowns and made the circuit from Greenwich Village jazz spots to legendary midtown venues like El Morocco, to 142nd Street in Harlem, site of the Cotton Club. “That era has always fascinated me,” says Allen. “It was one of the most exciting times in the history of the city, with tremendous theatre life, café life, and restaurants. Ben (Corey Stoll), the oldest of the three Dorfman children, is a gangster. “Ben sees that his father could never afford anything and was always struggling,” says Allen. “He got in with the gangs, found jobs that paid good money, but were not legal, and found that there was a very lucrative and glamorous life to be led outside the law.” While Ben has strayed ethically from the family, his devotion to his relatives doesn’t change—he is always around for family events and available to help everyone. Evelyn (Sari Lennick), the bright middle sister, becomes a teacher and marries Leonard (Stephen Kunken), a professor, and pursues a more cerebral life. Leonard, while something of a egghead, is a principled man who adores Evelyn. As Bobby is new to LA, Phil asks his assistant, Vonnie (Kristen Stewart), to show him around town. After she takes him on a tour of movie star homes and shares her experiences and opinions about Hollywood, Bobby is immediately smitten. “Vonnie is an ambitious, fresh girl who is completely aware of the surface nature of the business she’s in,” says Stewart. “It’s fun and exciting, but there’s also an emptiness she sees—and that gives her charm.” Says Eisenberg: “I think both characters are constantly attracted to and resisting the allure of the glitzier side of the city of entertainment. But Vonnie provides a wonderful antidote for Bobby. She is cynical, funny, and seems to have a real world perspective.” Unfortunately, Vonnie has a boyfriend, and he must settle for her friendship. While in Los Angeles, Bobby befriends two fellow New Yorkers, Rad Taylor (Parker Posey), a vivacious woman who owns a modeling agency, and her wealthy producer husband Steve (Paul Schneider). Steve invites Bobby to a screening of one of his movies at their home, and Bobby gets his first taste of what a life in Hollywood might hold for him. When Vonnie’s boyfriend abruptly breaks up with her, Bobby seizes the opening to romance her, and eventually she returns his affections. While he is starting to move up the ladder at Phil’s agency, he comes to the conclusion that Los Angeles is not for him. He asks Vonnie to marry him and come back to New York and lead a bohemian life in Greenwich Village. Vonnie seems on the verge of saying yes when her ex-boyfriend comes back into the picture. Although she loves Bobby, she decides on her ex-boyfriend instead, leaving Bobby devastated. Returning to New York, Bobby goes to work for big brother Ben, who has taken over a nightclub called “Club Hangover.” Bobby quickly proves a smooth operator, naturally able to work a crowd, with an instinct for how to attract the brightest members of Café Society to the club. Rad convinces him to remodel and change the club’s name to the more chic-sounding “Les Tropiques.” Soon the place is teeming with socialites, celebrities, politicians, and playboys, and Bobby roams freely among them, the genial host of the never-ending party. Meanwhile, Evelyn and Leonard are struggling with a surly next-door neighbor who is becoming increasingly threatening. Leonard’s mild attempts to resolve their conflicts in a reasonable way only seem to make the situation more volatile. Concerned for Leonard’s safety, Evelyn asks Ben to speak to him, a request she will later regret. New York style had a different feel because people, influenced by the heady cultural life that was swirling around them, were buying the tuxedos and couture fashion themselves. “New York women were a little more European, a little more chic than the women in California,” says Benzinger. “This was the time when all these French designers were appearing in New York, and among the ladies there was a huge competition with Chanel and Schiaparelli.” As she couldn’t rely on the mostly black and white pictures of the era, Benzinger had to resort to other techniques: “I would read articles from ‘30s fashion magazines that said things like ‘This is the hot color from Paris!’” she says.